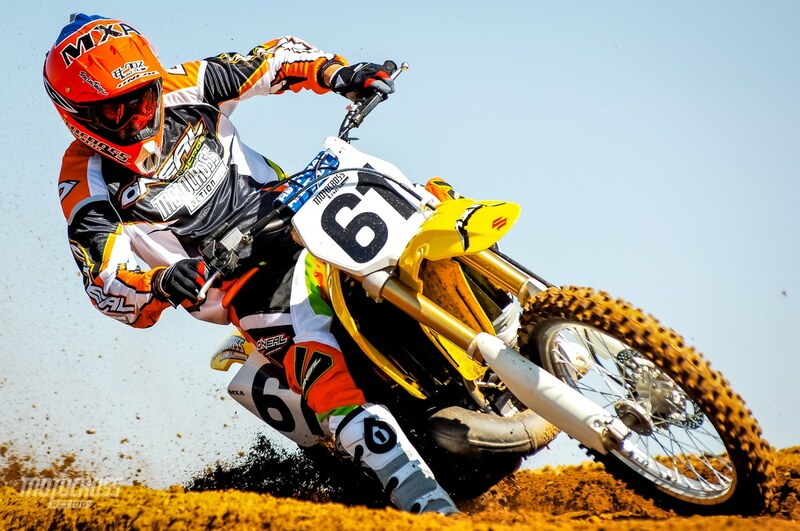 The MXA wrecking chose the Suzuki RM250 as the 250cc two-stroke Bike of the Year in 2004 and 2005. To our way of thinking, only two bikes were worthy of consideration for the 250cc two-stroke crown—the YZ250 and the RM250. The 2005 Yamaha YZ250 was a terrific machine. It had stable handling, aluminum frame, decent suspension and a tractor of an engine. So why didn’t it win? That’s simple. In a world dominated by booming thumpers, the Suzuki RM250 exhibits the exact opposite traits of a four-stroke. Where the four-strokes are torquey, broad, beefy, slow revving and tractable, the RM250 was snappy, barky, nimble, sharp, light and aggressive. 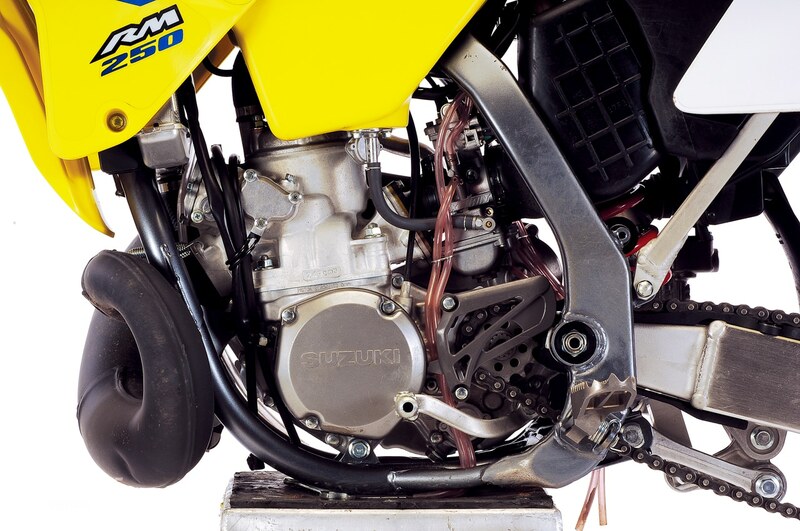 In a nutshell, the Suzuki RM250 is everything that a four-stroke isn’t. What we admired about the 2004 RM 250 and 2005 RM250 was their uniqueness. In what is rapidly becoming a clone world—t is a rebel. Yes, Virginia, we know that rebellion doesn’t always play well in the hinterlands, but if you are still considering riding a 250cc two-stroke, you must have a streak of rebel in you. The MXA wrecking crew awarded the whole ball of wax to the RM250 in 2004 and 2005 because it was the most two-stroke of all the two-strokes. That’s something to be proud of. The question at hand is whether the 2006 Suzuki RM250 can make lightning strike three times. 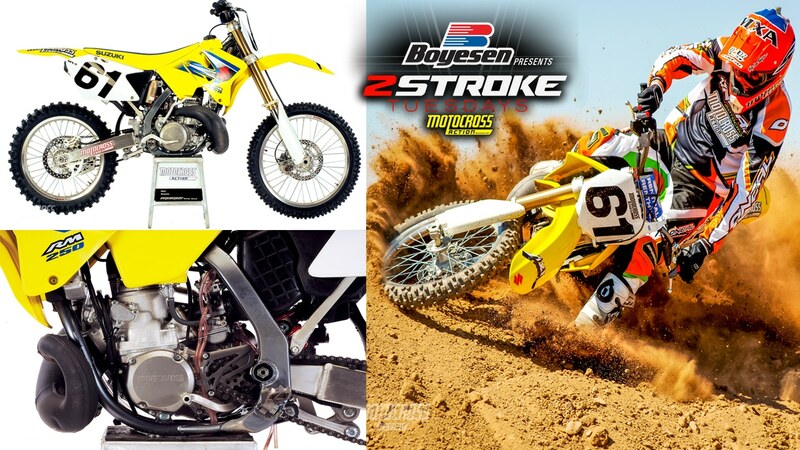 Q: IS THE 2006 RM250 ENGINE FASTER THAN THE ’05? A: Yes, but it doesn’t feel faster. That may sound like a left-handed compliment, but don’t be confused. The 2006 Suzuki RM250 doesn’t feel faster than the 2005 model, but it has a vastly improved powerband. And, the best thing about the new powerband is that it is easier to go fast on than previous RM250 iterations. How so? Prior to 2006, an RM250 powerband could be described thusly: Not much bottom. A hard hit in the middle. A rapid turnover. Brisk power into the upper middle. An early sign-off. In short, it hit hard and pulled hard—just not for very long. For 2006, Suzuki added considerably more low-to-mid power. The sudden hit in the middle has been accentuated by a nice, pleasant and usable roll-on power that starts close to idle. The ’06 picks up cleanly off the bottom and surges through the midrange. Very nice. Q: WHY DOESN’T IT FEEL AS FAST AS THE 2005 MODEL? A: The added low-end takes all the dramatics out of the midrange hit. Last year, very little happened, and then suddenly the RM250 burst to life. Now, things happen with minute twists of the wrist and the bottom end is filled in enough that the old-school midrange hit is less noticeable. It isn’t less of a hit, just that the hit is melded into a bigger picture. Q: IS THE 2006 RM250 ENGINE BETTER THAN THE 2005 MODEL? A: Lightyears better. Thanks to the enhanced bottom-to-mid transition, the Suzuki has double the number of options for its riders. In the past, the best solution to every situation was to hammer the throttle and hang on. It was a gun-and-run engine that didn’t like to be run at quarter-throttle, half-throttle or three-quarter throttle. It demanded full throttle whether the corner was loose, hard or off-camber. Not so in 2006. Hallelujah! The RM250 can now be ridden with a sensitive wrist through tight turns. It can be babied around an off-camber at quarter throttle. It can be coasted and blipped through switch backs. The 2006 engine is versatile. The previous version of this powerplant was flat-out or nothing. 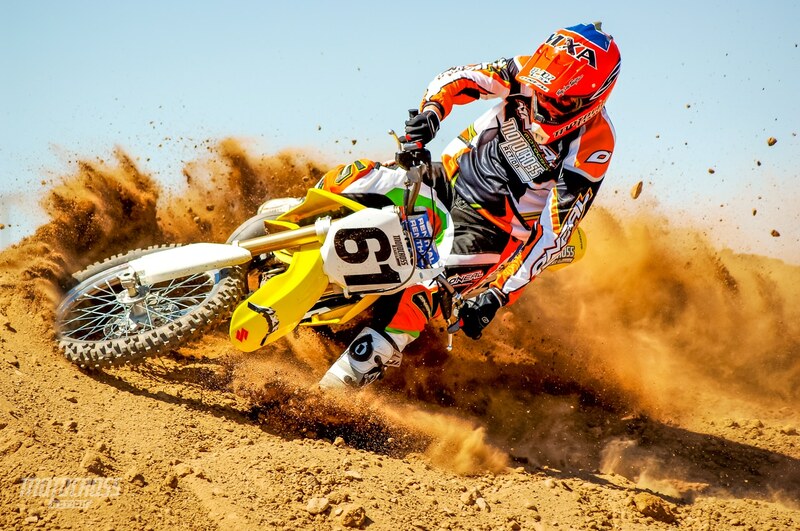 Q: HOW DID SUZUKI IMPROVE THE 2006 RM250 POWERBAND? A: We admire Suzuki’s straightforward strategy for the ’06 engine. No gimmicks, just six tried-and true tuning techniques. (1) Exhaust ports. Last year Suzuki raised the corners of the exhaust port and widened the boost ports to get a little more top-end overrev. This year they reshaped the exhaust port, advanced the port timing and optimized the boost ports. They didn’t undo what they did in 2005, but went for a middle-of-the-road porting strategy. (2) Power valve. Suzuki altered their power valve to delay its opening momentarily to help the low-end power. Then, they sealed up the sub exhaust valve ports to cut down on blow-by and worked on the cam rod, valve arm and valve linkage for quicker actuation. (3) Carb intake. By shortening the carb intake pipe they cut down on lag time for increased low-end. (4) Crankcase volume. A two-stroke engine is a air pump, and the crankcase is the pump’s diaphragm. By changing crankcase volume, you can increase or decrease pumping pressure, fuel flow or fuel density. For 2006, Suzuki increased the clearance between the crankshaft and crankcase to increase crankcase volume and change the primary compression ratio of the engine. This aids low-end power. (5) Ignition. The CDI mapping was reconfigured for more response at low rpm. (6) Reed petals. One of the easiest ways to improve low-end power, on any bike, is to install more flexible reed petals—ofter reeds open sooner. For 2006, Suzuki has all-new carbon fiber reeds. 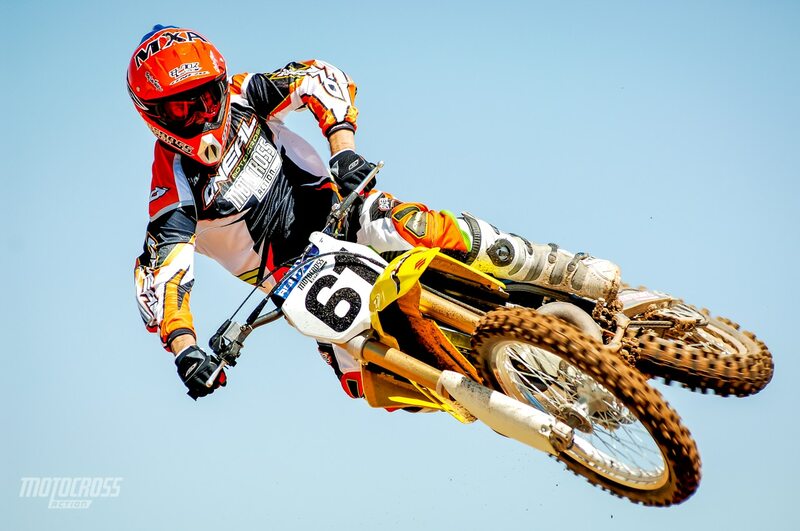 Q: WHAT DOES THE 2006 RM250 POWERBAND FEEL LIKE ON THE TRACK? A: The biggest compliment we can pay the 2006 RM250 engine is that it is more like a Yamaha powerband than before. The YZ250 is an amazingly flexible engine that can run from right off idle all the way to the shrieking top-end. Best of all, the YZ250 can accept every throttle setting without a whimper. For 2006, the RM250 engine has cloned some of Yamaha’s magic (but not all of it). The ’06 RM250 is more flexible. The most meaningful praise test riders had for the ’06 RM250 powerband was that late in a moto, when they got tired, they could keep the RM250 moving briskly with little or no effort. Conversely, on the 2005 RM250, you either went all-out or you went slow. Our test bike made 46.2 horsepower. A: We struggled a little in the heat of summer with richness, but that is perfectly normal. For hot days we used the supplied half-clip-leaner NEDK needle (with the clip in the third position) and a 165 main jet. Q: WHAT ABOUT THE CLUTCH? A: Ghastly. It was mushy and vague when fresh, and it didn’t stay fresh for very long. 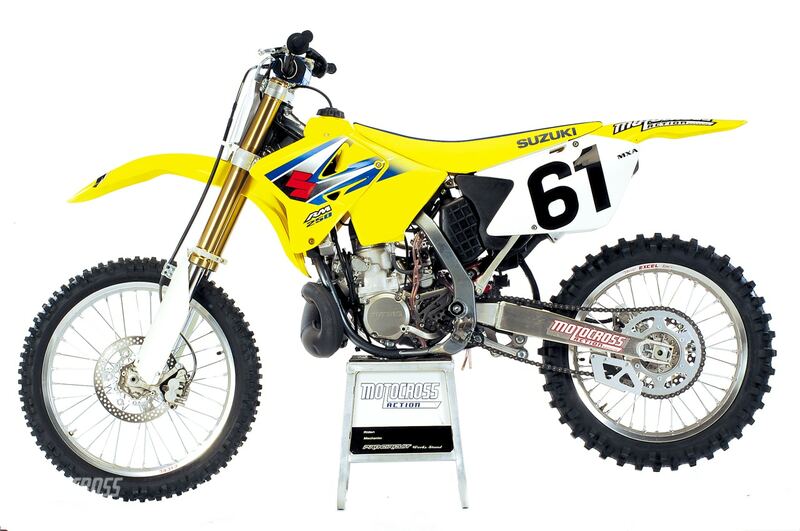 Suzuki upgraded the plates and basket for 2006, but it was a losing effort. The weakest clutch in the 250 class. A: Suzuki is the only manufacturer willing to push the handling envelope. Each manufacturer has its own personality—etched in stone. Honda started playing it safe in 1994 when they neutered the super-accurate ’93 model. KTM never took a chance on building a bike that would turn. Kawasaki’s handling is an acquired taste—for ax murders. Yamaha has a middle-of-the-road chassis that doesn’t do anything wrong—or anything great. Suzuki, on the other hand, is all cut-and-thrust. They are willing to give up straight-line stability for quickness, to trade a little head shake for accuracy in the corners and to seek one superlative at the cost of others. The question you have to ask yourself is-—are you willing to give up some sense of security at speed to be able to slice, dice and Julienne the competition in the corners? Answer “yes” and you have no choice but to race a Suzuki. It is the only bike that can walk the tightrope between brilliant and schizophrenic. Q: DID SUZUKI TRY TO CALM THE HANDLING DOWN IN 2006? A: No. They gave it some lip service in their press releases, but, in reality, Suzuki rolled the dice in 2006 and made the chassis even quicker by cutting the steerer tube off the old frame and moving it back 5mm. 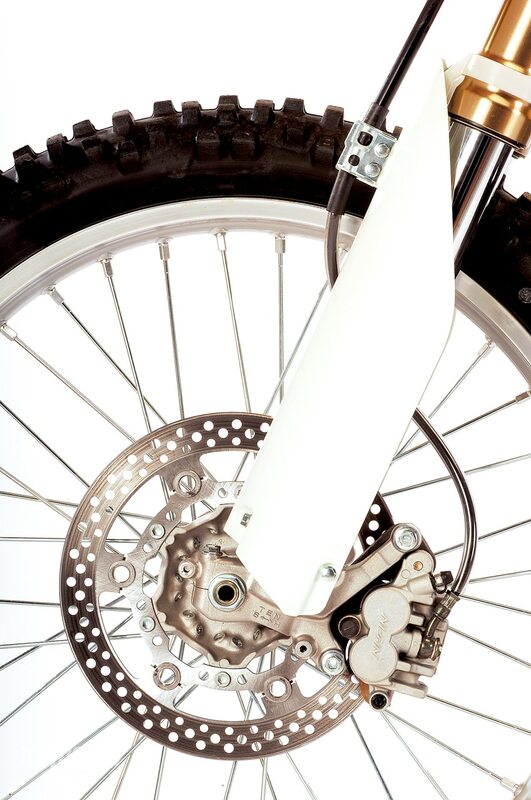 By altering the head tube, Suzuki moved the engine forward to put more weight on the front wheel. 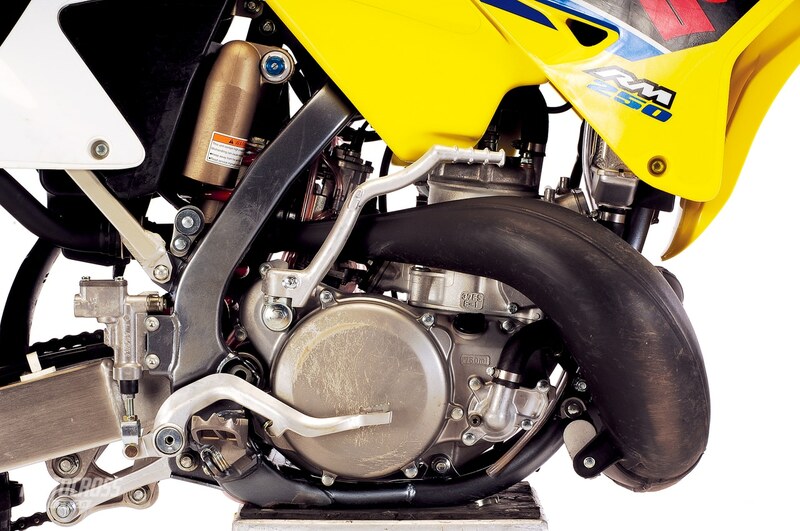 More weight equals more bite in the turns and is something that some of Suzuki’s competitors could benefit from, but we have to confess that we don’t think the RM250 needed to turn better. It was already super responsive. We saw Ricky Carmichael try this new frame out at the Las Vegas Supercross. It wasn’t legal to race, but he rode it during the day sessions just to get a preview of what 2006 holds for him. What do we think of the new frame? We think it turns better. We didn’t fret over the increased head shake because racing a Suzuki is all about setup. Seeking perfect balance between the front and rear is a constant ballet of race sag and fork tube height. We slid the forks down in the clamps, ran 100mm of sag and kept our reflexes on Defcon-4. Q: HOW GOOD IS THE 2006 RM250 SUSPENSION? A: Showa’s on a roll. Very good stuff. Very good indeed. Forks: Good forks. They are stiff enough for Pros, yet can be toned down for much slower riders. We ran the compression setting on eight clicks out and the rebound on 13. 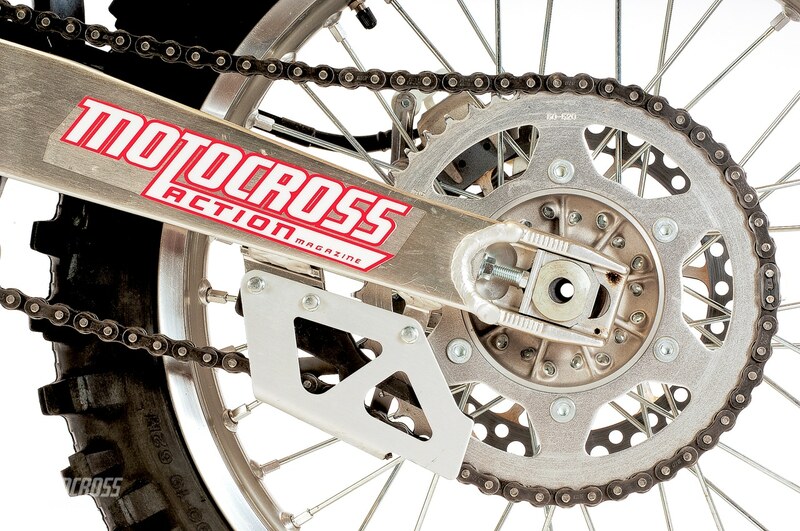 Shock: Every MXA test rider loved this shock—without exception. It goes straight through the nastiest stuff. Never kicks, hops or burps. It can barge through anything. Set the rebound on 12 clicks out, low-speed compression on 10 and high-speed between 1-3/4 and 2 turns out. (1) Tires: We can’t live with the Bridgestone front tire. It tracks into corners decently, but lets go without any warning. On a bike with a tendency to oversteer as much as the RM250, you need the best rubber possible. Drop-kick the Bridgestones. (2) Clutch: At least it didn’t jerk or chatter like it used to, but it also didn’t work very well. We opted for the stiffest clutch springs we could find. (3) Front rotor: We don’t see any difference between Suzuki’s rotor and their competitors’, but we constantly bend Suzuki rotors and no one else’s. (1) Brakes: All the pucker power you will ever need. 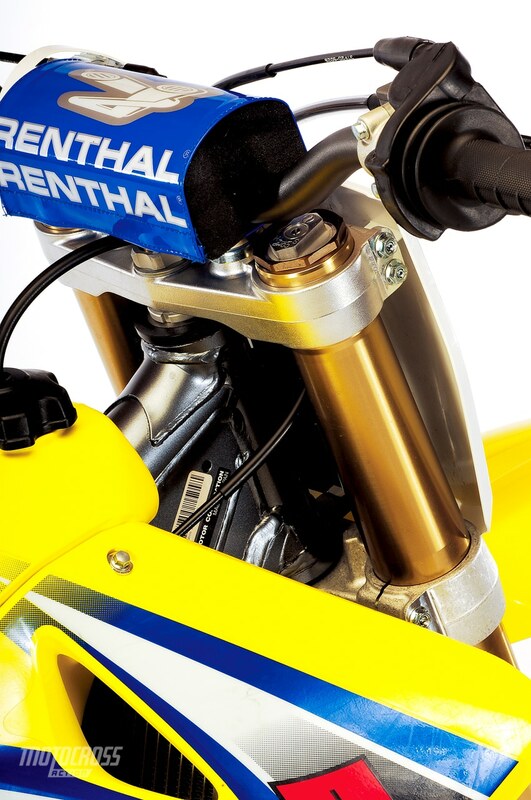 (2) Bars: Last year Suzuki had generic aluminum bars on the RM250. This year they have true-to-life Renthals. (4) Graphics: The blue and yellow look is stylish. For $300 more you can order a Team Makita Replica with a black seat, gold rims and team graphics. A: Don’t write that check for a new four-stroke until you’ve thrown a leg over this 250cc two-stroke. It’s like no other bike on the planet.